The Royal Christmas Fair is located in the historic heart of The Hague. Surrounded by the Binnenhof, Noordeinde Palace, various embassies, museums, and atmospheric shopping streets such as Denneweg, and the Plaats and Plein squares. A day’s visit to the most beautiful Christmas fair in the Netherlands is simply perfect for a day or night on the town in The Hague! With an optional visit to Scheveningen to get a breath of fresh air on the beach in addition to the atmospheric Royal Christmas Fair and the aforementioned attractions. Lange Voorhout is located in the centre of The Hague. Easily accessible by car, bicycle and public transport, and within walking distance of Central Station. The entrances to the Christmas fair can be found at the Kloosterkerk (Cloister Church – corner Parkstraat/Lange Voorhout), hotel Des Indes (Denneweg), and the American embassy (Tournooiveld). Free access, 12 to 23 December 2019, open every day from 12h00 to 21h00! The programme at and during the Royal Christmas Fair is essentially versatile. In addition to atmospheric decorations with fire baskets and twinkling lights everywhere, there are Christmas actors, (children’s) choirs, the one and only real Santa Claus, cultural activities and performances! Check out our Facebook page for more up-to-date information. The Hague is a city rich in culture, attractions, and events. And on top of that, it is an international city with a royal allure. You can find abundant information and the extensive programme of what’s on in The Hague at www.denhaag.com. 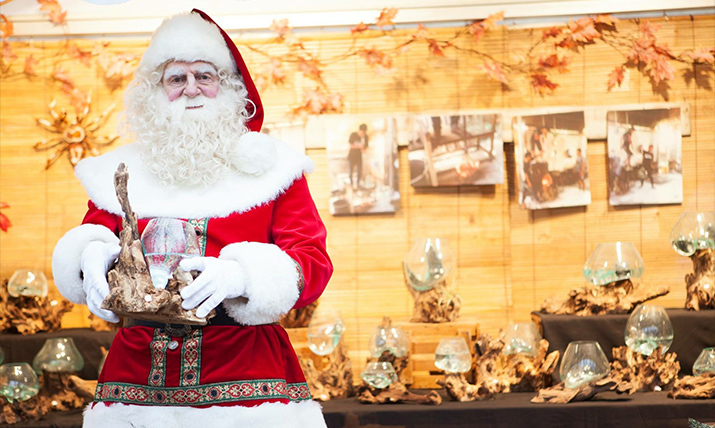 A visit to the Royal Christmas Fair simply ‘has to be’ accompanied by a shopping spree in the Shopping City The Hague! The choice of shopping in the City Centre, on Frederik Hendriklaan, and at the world-famous Hague Market (the largest in Europe) is absolutely unsurpassed. For more shopping information, you can take a look at www.binnenstaddenhaag.com, www.defred.nl and www.dehaagsemarkt.nl. All over the city centre, The Hague offers a varied and tasty range of food and drinks. And because anticipation is half the pleasure, at www.haagsefoodie.nl you can start looking forward to the numerous Hague delicacies! Royal Christmas Fair The Hague is an initiative by Walbroek Media & Haagevents.